Published: December 20th, 2017 by Simon. Filed in Tiles and tagged bathroom tiles, feature tiles, kitchen Tiles, Splashback Tiles, tiles. Feature tiles make for a wonderful addition to any bathroom or kitchen. They’re available in a variety of colours and designs and they allow you to make a bold style statement. If you’re looking to add character or vivacity to your home, then feature tiles are a great option for you. 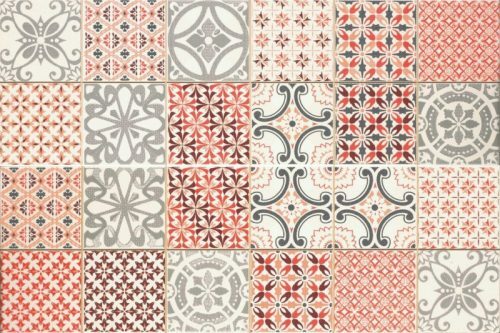 But which feature tiles should you choose for your space? As Ross’s Discount Home Centre’s head of purchasing, this is one of the most asked questions by customers. As such, I thought that this would be a great time to list some of the best feature tiles available at our store. So, continue reading this post to discover 4 in-your-face feature tiles that are perfect for use in kitchens and bathrooms. 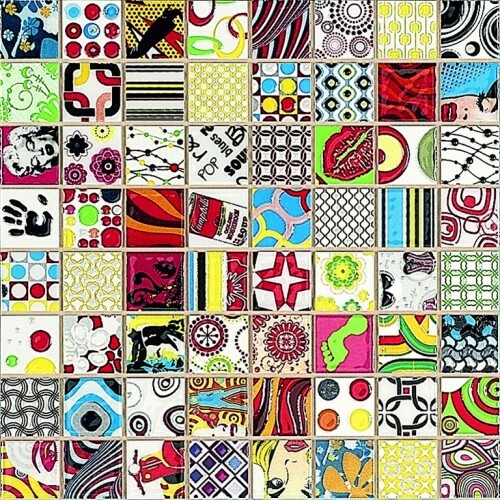 If you like pop art and you’d like to incorporate some elements of it in your home, our Andy feature tile is perfect for you. This gorgeous ceramic feature tile exhibits a mosaic of colourful pop art comics, with 64 designs combined into a single tile. It is very easy to clean and maintain and is ideal for use in kitchen splashbacks. When it comes to creating a durable and contemporary splashback on a budget, you’ll find nothing better than our Andy feature tile. To create a decorative feature wall in geometric patterns, the Al-Andalus feature tile is just what you need. This tile is sold as a set of two deco tiles which exhibit multiple geometric patterns in shades of white, black, red and grey. It has been cleverly designed for easy installation with minimum grouting and this tile is built to last. The Al-Andalus feature tile is perfect for use as a wall tile in modern bathrooms and kitchens as it is highly resistant to moisture. For a sophisticated and refined feature wall tile in Perth, you’ll find nothing better than our Deco Heritage Mix Multi feature tile. This elegant feature tile exhibits a random display or deco patterns in multiple earthy colours. It is specially designed for installation in high traffic and high moisture areas and is also suitable for bathrooms and shower walls. Whether you want to create a refined bathroom/shower wall or a feature wall for your kitchen, the Deco Heritage Mix Multi feature tile is the perfect choice. To give your home a facelift on a budget, consider using our Grenier Mix feature tile to create a feature wall. 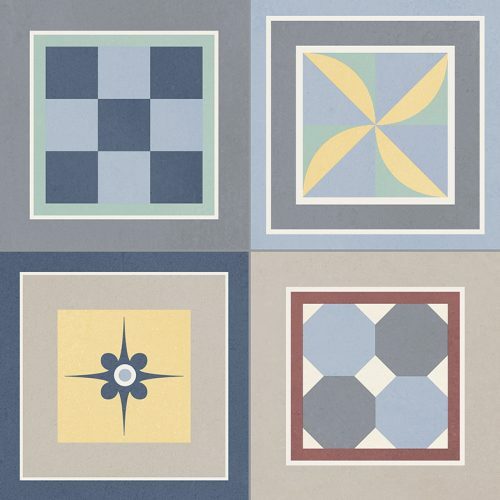 It is a glazed porcelain tile which sports a variety of geometric patterns in different colours. There are a total of 52 geometric patterns in total, which allows you to mix and match to create the perfect look. 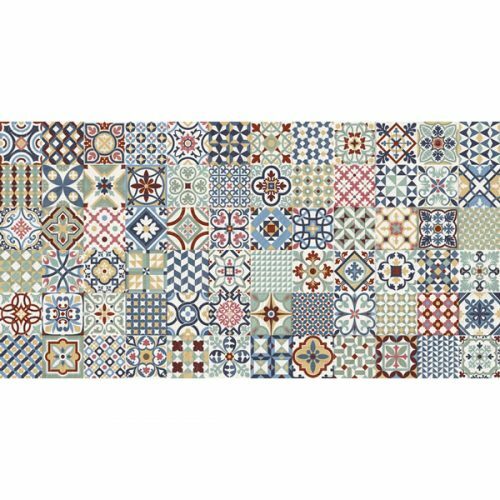 This tile is uniquely designed to withstand vapour condensation, making it ideal for installation in kitchens, shower walls and bathrooms. It can be used both as a wall tile and as a floor tile, thanks to its special, slip-resistant surface. Feature tiles are perfect for use in kitchens and bathrooms as splashbacks, feature walls and floor tiles. At Ross’s Discount Home Centre, we offer a range of stunning feature tiles which offer exceptional value for money. Of our collection, check out our Andy, Al-Andalus, Wow, Grenier Mix and Golden Spring Glass feature tiles. Each of these distinctive feature tiles presents bold patterns and they are perfect for creating a style statement. Moreover, every one of these feature tiles offers exceptional value for money, which you cannot expect to find elsewhere. To purchase any of these feature tiles, head over to our showroom in Guildford or shop from us online today!